At DEBRADALE DESIGNS we know paper. We have spent the last 30 years providing high-quality paper products to businesses in our community. The paper that we use is sourced only from the United States, so you know that it meets all current responsible forestry initiatives and contains recycled content. We currently offer over 50 items on Amazon, blank and printed. Our products use three different grades of paper. Economy, Standard, and Premium. Because our products are made in a small production environment, we can offer items that require more specialized handling. Our products do not roll off of an assembly line which is what allows thicker and heavier paper to be used. We are proud of the products that we make, and we back them up with a one-year money back guarantee! OUR STANDARD 110# INDEX BLANK FLASH CARD IS A LARGER 3.5 X 2 INCHES And A Heavier And Smoother 110# Index Card Stock Than The Pacon Brand. YOU'VE GOT CHOICES Do You Desire A Heavier Card Stock? No Worries . . . DEBRADALE DESIGNS Has Over 30 Combinations Of Color, Size And Paper Weights. 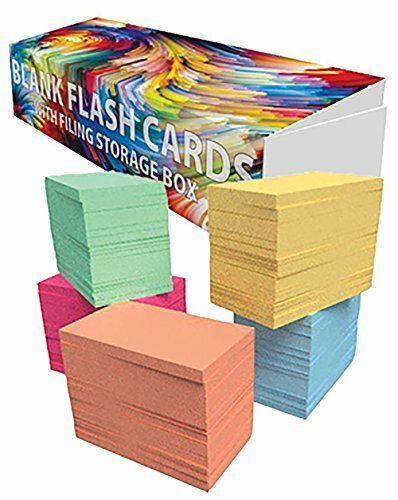 BECAUSE OUR INDEX FLASH CARDS ARE BIGGER AND STURDIER Than Similar Brands You Can Be Assured That They Will Be Easy To Write On And Will Hold Up To Repeated Use. WITH 5 COLORS AND 1,100 CARDS You Will Have Many Options For Organizing Your Study Cards. We Also Include A Custom Designed Storage Travel Box With Attached Lid. Of Course, All DEBRADALE DESIGNS Products Are Manufactured In The U.S. Using Domestic Papers That Meet All Recycling And Forestry Initiatives. If you have any questions about this product by DEBRADALE DESIGNS, contact us by completing and submitting the form below. If you are looking for a specif part number, please include it with your message.